Our mission is to provide unquestionable quality and service at competitive prices. Dining renovation with complex utilities coordination, custom carpentry, and special food service packages. 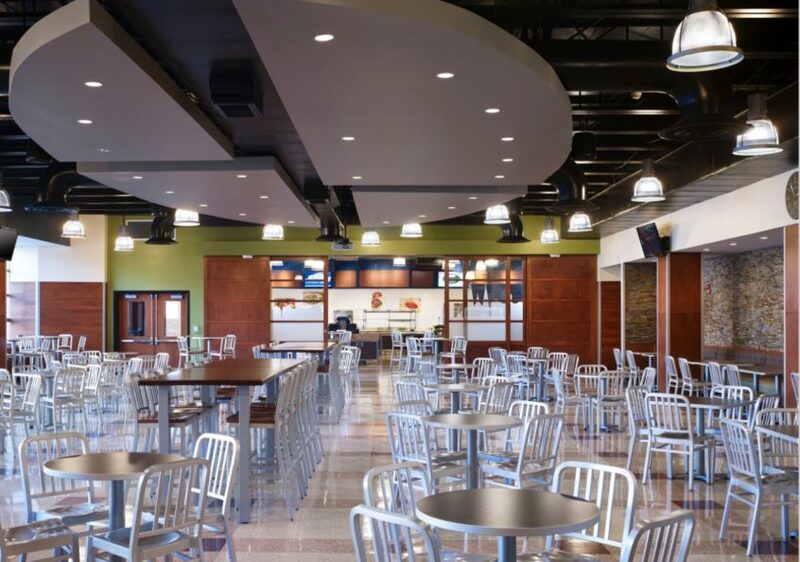 Dougherty Hall dining facilities were renovated and expanded to offer full-service dining with seating and other amenities. Flatiron performed the construction project over the summer academic break. The project included expansion of an existing prep kitchen into a full-service kitchen with upgraded equipment, a pizza oven, and an espresso bar, custom millwork wall panels and sliding doors, ceramic and stone wall tiles, and a special food service package of counters, serving, and storage fixtures. Complex coordination was performed for new kitchen utilities. Flatiron craftsmen built a floating ceiling and uncovered a long-hidden mural during construction that was uncovered and repurposed as a permanent artwork in the new space. © FLATIRON BUILDING COMPANY, ALL RIGHTS RESERVED.